I went to the store last weekend to buy some hats for my Christmas cards for the girls to wear. They looked horrible and cost $3 each.. So I bought some yarn and made my own! Rnd 23) Reverse sc around, fasten off weave in ends. Add pom pom to top of hat. I love this! The hats are adorable, as are your girls. Thanks for sharing this cute pattern. Best to you and yours at Christmas and in the new year. 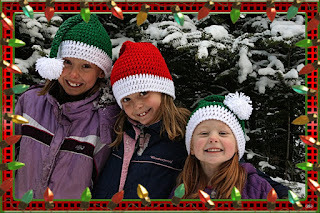 thank you for sharing your pattern, the hats are wonderful! Thank you soo much for sharing your pattern. This works up super quick. i liked making this one more then the other one i made that was all SC. I am also following you on here and Ravelry. aww, thanks so much everyone! Thanks for this pattern. I plan on making two for my daughters to wear to their junior high orchestra concert. Happy holidays! I dont know if this is still open for discussion but I have made two now and bothe time the top is never long like the ones shown on here? and suggestions? @crystina and betts....for row 2 of the pattern it says to "round 2 and all even rounds" are you doing this round again after every odd/increasing round? this is where the length comes from in the pattern...Hope this helps. I made one this morning and had no trouble. Is this hat big enough to fit an adult? Very nice pattern. Can I translate that to Danish and share it with my friends.?? Is there any way to use this pattern for my baby on Christmas this year? In size 9-10 months or would I have to shrink the pattern? Not sure what I did wrong but I ended up with a hat that was HUGE! I had to put a ton of decreases in once I started the white part just to try and make it small enough to wear. I used the right hook and thought I followed the instructions correctly so I'm not sure where I went wrong. Mine didn't even fit an adult much less a child. The hats are so pretty. And I can tell that your kids really love them. I have made these hats in several sizes. One year old I stopped increasing after row 11 then continued to row 17. Row 18 for the backward crochet. I made two so far for two different one year olds by following the above, worked beautifully. They love them. I just found your pattern. Thank you for sharing. I am going to adapt the pattern to fit my husband and add it to a ballcap. I bought him a ballcap Santa hat before and he loved it until it was no longer useable. Can this be done on a crochet ring? Round 4 is missing? Did I missing something?? Every even # row, you do 1 dc in each stitch around. The odd # rows are where you increase. How do you size for adults and children? The instructions look like a one size fits all but I'm sure it isn't. Has anyone ever gotten responses to their questions on here?